"I think every school has its own group of Pops. Basically they're at the top of the middle school food chain." The non-Pop girls--Jenny, Felicia, Rachel--are bored. Television stinks; the weather stinks; and as they rummage through Jenny's collection of old home movies for entertainment, they run across the video of her third grade sleepover and Easter Egg Hunt. Laughing over the sight of themselves as eight-year-olds make them yearn to do something telegenic, and the girls suddenly come up with the idea of producing a webcast for the middle school audience. Titling it the Webcast Underground (for the basement from which it is to be broadcast), they soon recruit Marc, their movie fan friend, as director, Liza, their artsy pal, as set designer, and Chloe (who has a new laptop) as their tech person. Jenny prepares promotional flyers to blanket their middle school, and when their talent show takes to the webwaves, the non-Pops find themselves, well, instant celebs at Joyce Kilmer Middle. But their moment as neo-POPs doesn't last. The Pops can't stand to give up center stage and waste no time in trotting out their competitive webcast School Style. But for their second show, the Pops get more notoriety than popularity. They select a bespectacled plain Jane non-Pop named Melissa for their glamor makeover special. The webcast goes great, but when they trot out their new beauty queen at lunch the next day, the nearsighted Melissa, not wearing her dorky glasses, of course, mistakes the false eyelash she drops in her soup for a spider, and there's a lot of flying food decorating the perfect outfits at the Pops table, to the amusement of the whole cafeteria. 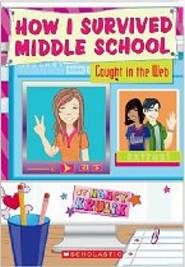 As usual, the Pops get their comeuppance, in Nancy Krulik's Caught in the Web (How I Survived Middle School), the continuing middle school saga featuring Jenny and her non-Pop friends whose humor and resilience make sixth grade fun despite everything. Other books in the How I Survived Middle School series include Can You Get An F In Lunch? (How I Survived Middle School), Madame President (How I Survived Middle School), It's All Downhill From Here (How I Survived Middle School), I Heard A Rumor (How I Survived Middle School), Who's Got Spirit? (How I Survived Middle School) and Cheat Sheet (How I Survived Middle School).